Burn injuries are among the most serious and painful types of personal injury one could experience. What people may not be aware of is that in addition to the pain and suffering as a result of the damage to the skin and nerves, without the skin to protect the wound, there is a high risk for developing serious and even fatal infections. In fact, secondary infection is one of the major causes of injuries following a serious burn accident. Another misconception many people have about burn injuries is that a third degree burn is the worst type of burn. There are actually four types of burn injuries doctors see in a typical personal injury burn case. A first degree burn is the mildest and is typically caused by the sun and causes redness on the skin. A second degree burn involves damage to the outer layers of skin and can involve blistering and bleeding. A third degree burn involves a burn of all layers of skin, muscle and connective tissue and is extremely painful and has a high risk of infection. The worst type of burn is a fourth degree burn that involves a full thickness burn when even the bone is destroyed by the heat and fire. A recent news feature from the Supply House Times looks at how to treat burn injuries and what you should avoid doing. One of the most important things to do when trying to provide assistance to a burn victim is make sure you know the cause of a burn. While we typically think of fire or hot cooking oil as a major cause of burns, not all burns are caused by heat. Burns can be caused by caustic chemicals and electricity. 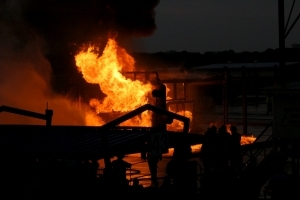 A person who has been burned by a caustic chemical may still be suffering from the chemical exposure, and that must be neutralized immediately. While it might seem like a good idea to put water on the site of the burn, depending on the type of chemical causing the burn, that may only make matters worse. Hopefully, anyone working with a caustic chemical will take the time to the read the materials safety data sheet before handling and will have access to a proper reversal agent. If you do not know what to do, call emergency services immediately for assistance. In the case of an electrical burn, you should make sure the victim is away from the source of the current or the current is shut off before coming in contact with that person. One of the most important things you can do to make sure your health is being looked after and your rights are being preserved, should you need to file a personal injury lawsuit in Boston, is to make sure you do not turn down medical assistance when it is offered. If the first responders ask if you want to go the hospital or recommend that you go, you should accept this offer and never decline medical attention.